Successfully Added Onda V80 Android Tablet - Quad Core CPU, 2GB RAM, 4200mAh Battery, ANdroid 7.0, 8 Inch HD Display to your Shopping Cart. The V80 Android Tablet has a reliable AllWinner CPU and 2GB of RAM. 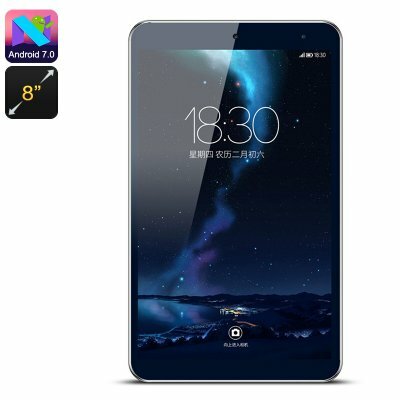 With this masterful Android 7.0 OS, this sleek 8-inch tablet brings you high-end media and enjoyable mobile entertainment. The Google Play store ensures you'll have access to the very latest apps and games which while a 4200mAh battery offers plenty of time to enjoy them all. So if you’re into gaming, watching movies and working with mobile applications, or if you simply like to browse the web and stay connected family and friend online the Onda V80 is a perfect choice and it comes at an amazing price. This 8-inch tablet is a good size that you get a large clear screen but also not too big so as to make it hard to take with you. This makes it a great personal computer for busy people on the go who want to keep connected and have a mixture of work and entertainment supported. The Onda V80 Tablet PC comes with a 12 months warranty, brought to you by the leader in electronic devices as well as wholesale Android tablets and cool gadgets.